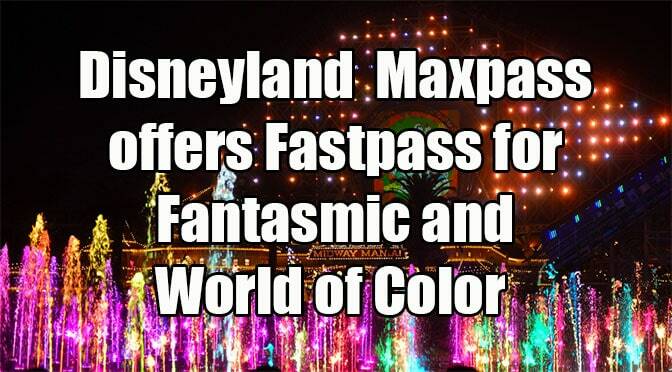 Disney – Beginning today, guests who visit the Disneyland Resort and choose to purchase Disney MaxPass to maximize their day will now be able to make digital Disney FASTPASS selections for select entertainment in both Disneyland park and Disney California Adventure park, right from their smartphones! Available as an add-on to your theme park ticket, Disney MaxPass helps you maximize your day to save time and experience more! I usually do the World of Color Dessert Party and River Belle Terrace Fantasmic! Premium Dinner Dining Package, but this is a great addition for those who wish to use the standing areas at each park. What do you think about this addition? If selecting a FP to the show, will we still be able to pick another/ride selection immediately, as was the case with the paper FPs? Or will it block another selection for 90 mins? Thats awesome can’t wait to see WOC…so if you fastpass either WOC or Fantasmic can u still make other fastpass selections throughout your day? Just not sure how the system works at Disneyland!